The Body Shop is one of those brand’s you know that a distant family member buys you one of ‘those sets’ for Christmas that you never use, usually it contains a net scrubbing bag…well so I thought. Not anymore. Over the last few years, the body shop has had a total overhaul and has totally stepped up their game. With instagrammable packaging and high-quality products, they’ve come along way in recent years to be a brand which is loved and trusted by the new wave generations as well as the older generations too. Before I headed to Ibiza I had picked up a sample of the Himalayan Mask and I raved about it so much. It made my skin feel absolutely amazing and really buffed it. 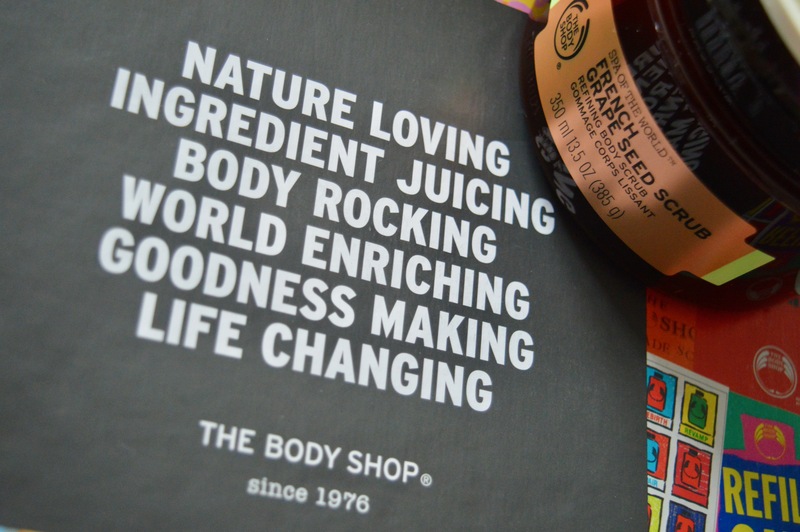 I was thrilled when a parcel arrived the other day with The Body Shop’s brand new range in. The three products were instantly eye catching in high-end packaging. An opaque brown in colour with complimenting lids, luxurious copper branding and an allure unlike any other The Body Shop products I’ve ever seen before. The new Spa of The World range was crying out for me to give it a whirl. The Spa of the World range makes a commitment to enriching not exploiting workers and you can read more about this promise here. First up of the three products. The French Grape Seed Scrub. 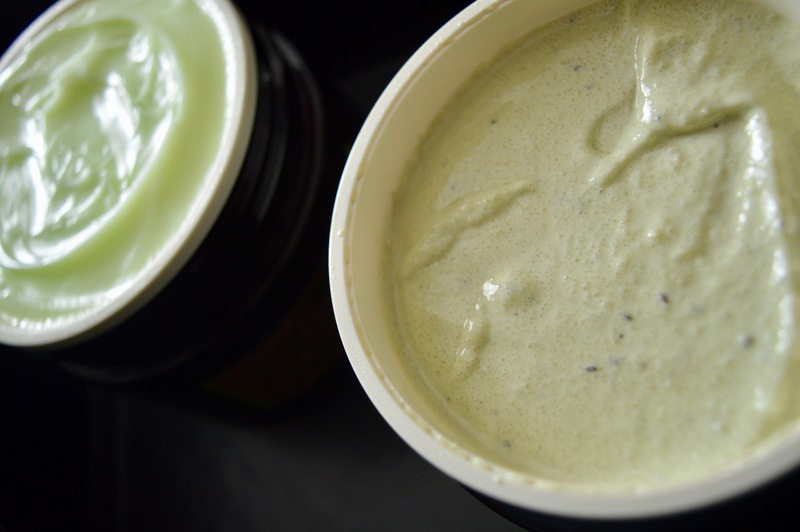 This thick mint green coloured scrub looked at home nestled into the large brown jar as I scooped some out, taking in the light and refreshing scent which instantly made me feel as if it was going to lift my spirits too. The scrub has been formulated to combine grape seed powder from France and Community Trade organic sugar from Paraguay. Invigorating and exfoliating the scrub has also been designed to refine your skin., the fresh and delicate fruity fragrance helps awaken and revive the senses. A factor in which works really well with the new collection is that products are 100% vegan and also ethical. As for my opinion? I agree with the 94% that say the skin looks and feels smoother and softer. I certainly noticed a difference even after a few uses and actually have genuinely incorporated using the French Grape Seed Scrub into my daily regime! 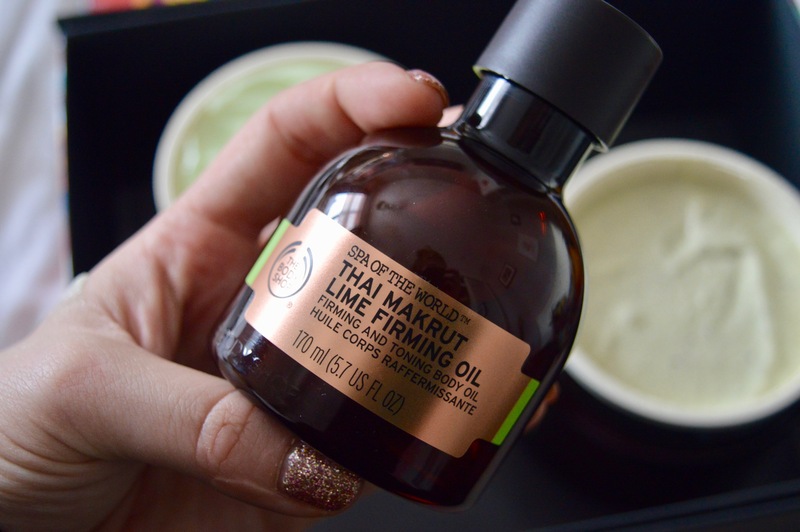 The next power product in the Firming Ritual trio is the Thai Makrut Lime Firming Oil. I thought this out of the three was going to be my least favourite product. I was clearly wrong. It’s simply spectacular. The Zingy Makrut Lime used after the French Grape Seed Scrub blend for a sense tingling awakening. The oil is light and absorbs into the skin rapidly without leaving a sticky residue. Teamed with the massage paddle the nourishing oil which is infused with Community Trade Marula oil is a perfect way to firm up whilst extremely relaxing. This product again is 100% vegan and ethically sourced. Having struggled all my life with orange peel skin after a week’s use of the three products combined again I agree with the 85% who said their skin looked and felt firmer after 4 weeks. If you’re a regular reader you’ll know I love a little bit of constructive criticism, I genuinely am blown out of the water with this new range and absolutely love it! To the extent, I’m buying the three products when I run out. If that isn’t a testament to the range I don’t know what is? 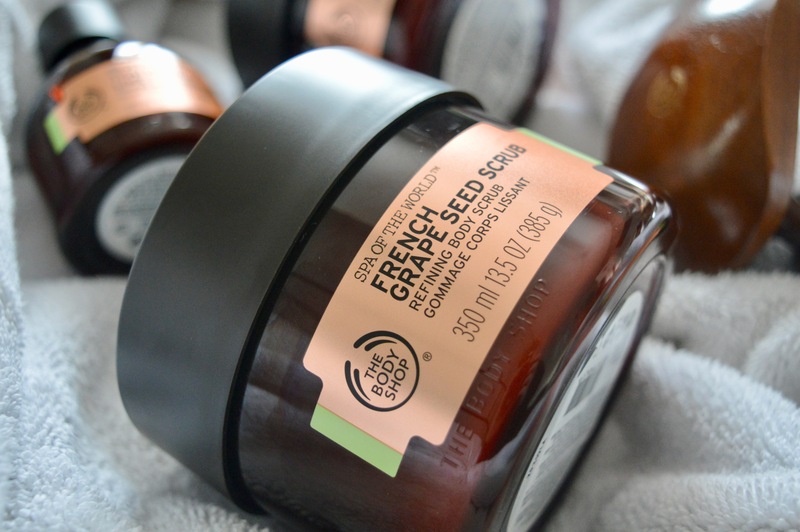 Let’s talk about the final product now in the three new The Body Shop Spa of the World range. Ethiopian Green Coffee Cream. I’m not a coffee lover, so was hesitant thinking that this would be pungent. 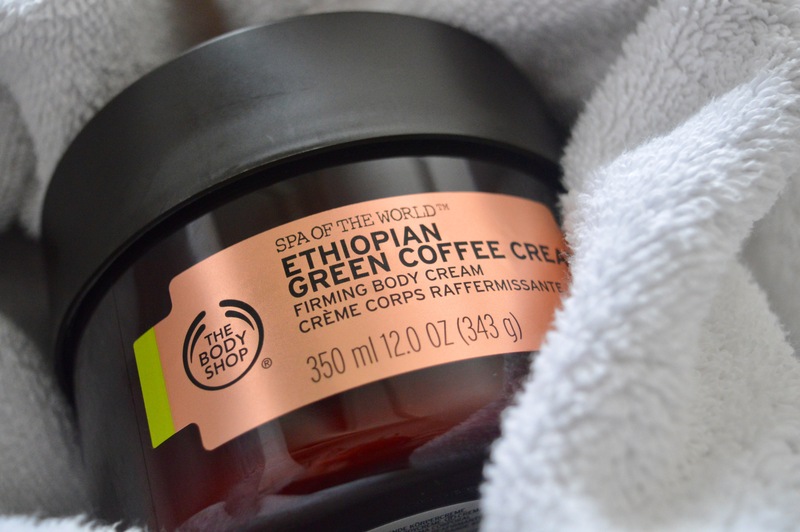 Again twisting the boundaries this thick luxurious forming body cream which has been enriched with Ethiopian Green Coffee, which is a natural stimulant to awaken and firm those bits that need a little loving. These beans are sustainably hand-harvested from the Kaffa region, which is known globally as the home of coffee. This is where Coffee drinking plays a monumental and almost ceremonial part in traditional Ethiopian culture. The silky soft cream just melts perfectly into the skin and used after the oil it is simply divine. You can’t help but get lost in the rich refreshing scents which after a long day are rejuvenating and really do lift your mood. As with the other two products, this is certified 100% vegan and a small amount goes a long way. It really does pain me to say this you know, I wanted to be able to say I loved 1 or two of the products but I champion all three. As in I’m going to certainly be purchasing them when I run on empty! You’re wanting to know the facts though yes? Of course, I agree with the 86% of the 101 people interviewed after 4 weeks. Yes, my skin looks more toned. It also looks brighter and healthier and more alive. Yes, I love this range and YES my clouded judgement of The Body Shop has totally changed! I absolutely love this range, and I mean genuinely love it. It has now become a daily staple and will be getting purchased when I’ve run out. That’s not a bold statement I usually make. So the smell alone is to die for! I seriously do recommend the Spa of the World new lines. Get them now. You really really really won’t regret it! Previous articleWait, you’re putting brands off! scrub first then cream then oil. I,m not sure now how to use it.